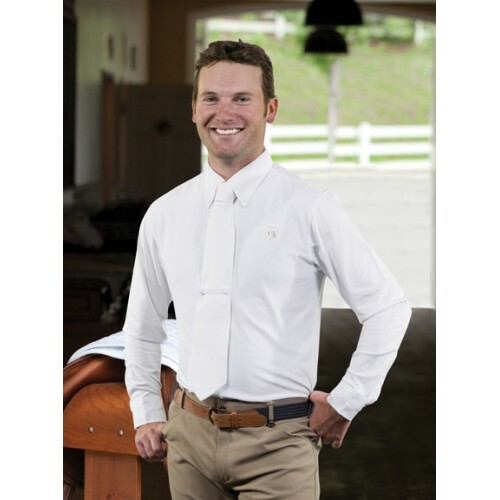 The Romfh® Men's Competitor Show Shirt - Short Sleeve has all the same moisture-wicking and cooling technology was out women's shirts, but made for a man. He will look sharp with the classic button-down shirt styling with removable tie stay, and keep cool with the Cool-touch™ fabric with Chill-factor™. Solid front with discreet micro-mesh sleeves and back for extra cooling airflow. Back yoke is super lightweight to keep him cool on the hottest of days. As the entire shirt is made of the softest and stretchiest of fabrics, he will be more comfortable and yet still look great with the crisp microfiber collar and cuffs.